First, the bad news. Most of you have probably already heard that abortion advocates have targeted New York City for an anti-pregnancy clinic effort similar to those in Baltimore and Austin. The proposed measure would force pro-life pregnancy centers to put signs on their doors saying that they don't perform abortions and don't "provide ... contraceptives approved by the Food and Drug Administration." I have no serious issue with the message that they don't provide contraceptives. 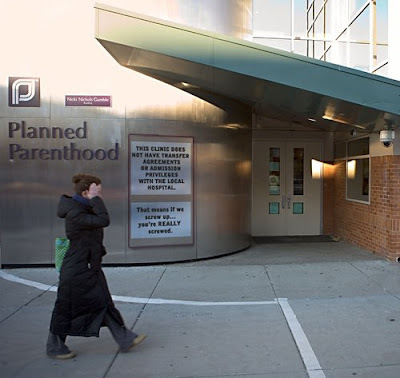 Unlike Planned Parenthood, which advertises itself as a "reproductive health" center generally, pregnancy centers and clinics are quite clearly for people who are pregnant. There's not a whole lot of demand for contraceptives in that demographic. But the proposed language makes it sound to me like pro-life pregnancy clinics have some kind of beef with the FDA, which is just strange and ought to be reworded. Second, I would be okay with the "we don't do abortions" sign if it were a two-way street. But when similar legislation was proposed in Baltimore, pro-lifers proposed an amendment requiring abortion businesses to post what services THEY don't offer-- e.g. baby supplies, parenting classes, adoption services-- and the amendment was shot down. From that, it's pretty clear that the aim of the legislation is not so much to inform women as to divert business. I would be stunned if such an amendment were tacked onto the New York City bill. Legally speaking, then, there's an equal protection issue on top of the free speech issue. The Baltimore law is currently being litigated. Hopefully, that case will come to a favorable resolution, and New York abortion advocates will think twice. Anyway, I like to balance bad news with good news, so let's turn our attention to Pittsburgh! There, pro-lifers have gotten an injunction against a local ordinance that hindered their ability to pass out literature. UPDATE: A commenter on Jill Stanek's blog shared this delightful photoshop: Why aren't pro-lifers fighting fire with fire, and demanding signs like this in cities where the abortion advocates haven't even tried their legislation yet? Free speech is not terrorism!